At First Choice Exteriors, we offer a wide variety of gutter colors, materials, sizes, and leaf covers. We have over 100 color choices to make sure you get the perfect color. We custom make 5″ & 6″ seamless gutter that can be made of aluminum, steel, and copper. Our most effective leaf cover system is Leaf Proof: a solid leaf cover system with a Lifetime No Clog Guarantee. Our gutter coils are baked on enamel finish with a thickness of .032″ for maximum strength and durability. We have 75 colors available as well as copper. We use an upgraded RAYTEC hanger. At 119 lbs. pull, 4 of our competitors’ hangers broke loose. At 140 lbs. pull, 3 more of our competitors’ hangers broke loose. At 230 lbs. pull, 4 more of our competitors’ hangers broke loose. The Raytec Hangtite� hidden hanger hold up to 297 lbs.! Downspouts are finished to match the siding and are available in multiple sizes and colors to fit any home’s water management needs. Gutter flashing is located under the shingles and prevents water from entering the area behind the gutter and rotting your soffit. Solid aluminum cover LeafProof Gutter Covers keep leaves and debris out of your gutters Fits your existing gutters Low profile Installs under first row of shingles WITHOUT penetrating the roof Blends with your gutters and roofline Can handle ANY downpour Eliminates the hazardous chore of climbing a ladder Prevents ice dams that form in the gutter Prevents animals and birds from nesting Lifetime no clog guarantee Made in the U.S.A. Leaf Exterminator sdfew Fits new or existing gutters Does not interfere with roof Invisible form the ground Can handle any downpour Eliminate the hazardous chore of climbing a ladder Strengthens gutter system Prevents animals and birds from nesting Made from 100% recycled aluminum EZ Black Powder Coated Gutter Screens (Good) EZ Black Powder Coated Gutter Screen Made of expanded galvanized steel, powder coated with a black finish for 5″, 6″, 7″, & 8″ gutter Small holes now available for better coverage less than � the size holes as shown above Copper available in regular hole pattern E-Z lock gutter screen is installed with the back edge that slides under shingles and front edge locks on the front lip of the gutter, ensuring that it will not collapse into the gutter. 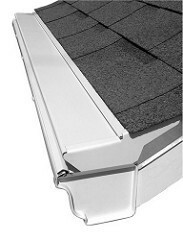 E-Z lock gutter screen is installed with the back edge that slides under shingles and front edge locks on the front lip of the gutter, ensuring that it will not collapse into the gutter.